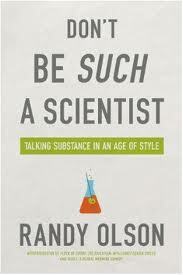 I’ve just finished Randy Olson’s “Don’t be Such a Scientist: Talking Substance in an age of style” (after loving his article in New Scientist, “Top five tips for communicating science “). Olson is a marine biologist turned filmmaker, so knows the world of science from the inside, and from the outside perspective. This book is 75% solid gold – absolutely essential perspective for scientists who want to communicate outside of their specialism. But it is also 25% misleading and elitistic simplification. At heart, Randy Olson’s message as a populariser ends up pandering to a mistaken belief in scientific exceptionalism – that what scientists do and who scientists are is so beyond the ken of the rest of the population that it cannot be conveyed to them, that we have to use a pound of silly songs and fart jokes to make the public to swallow an ounce of important information. Sorry, Randy, but when you underestimate the public taste you end up demeaning it. When you give a scientist a paper, he or she reads it with the assumption that the writer is guilty of being wrong until proven innocent. The writers proves his or her innocence by either presenting data or citing sources. With each statement made in the paper, the scientist reading it says “I’m not sure I believe this.” As the author presents graphs and tables of data and cites sources, the good critical scientist attempts to falsify what is being said. It’s a handy book to whizz through. I also liked some of his more general tips for communicating effectively. For example – arouse interest and fulfil it, don’t be too literal minded. Simple advice, but it’s amazing how easy it is to prepare a presentation or paper with a structure and early content that fails to grab the audience! To be fair, he does take some care to encourage scientists to find what he calls “your authentic voice”, conveying solid information without forgetting that you need a mixture of the rational, the emotional and the “gut”. One can craft a story about some research that does that without trying to hide it in amongst silly songs fart jokes. That was my reading of his conclusion, anyway. Plus, he has a great name! Nice, I’ll have to pick this up sometime. I think the no response is so hard coded that we sometimes struggle to even see we’re doing it. As we talked about in the session I ran up at your lab, often we’re trying to be helpful! We’re protecting our other lab members from their own mistakes, saving them from wasting time with our speedy interventions. But the effect is the same – chilling exploration and closing down avenues. And even with no malice aforethought, it can still sting when ideas are killed so early, and encourage us to retreat back under our shells, or entrain us that our best (and safest) contribution is indeed the negative contribution. Please tell me this isn’t an entire book based on just one small (albeit important) idea from Karl Popper’s work? He did quite a bit more – and the field of the philosophy of science is *so* much wider than just Popper. But scientific enquiry is based upon hypotheses… which are surely creative/imaginative perspectives? I think that’s the challenge, Ben. Science (the industry/reality) is hungry for the outputs of creativity – innovation and new approaches – but doesn’t cultivate a space and mindset for it, because the natural mode is analytic rather than synthetic or explorative. I think this is a real challenge, although I don’t want to overstate it as an inevitability. Lots of imaginative scientists out there breaking the limits.